For this kite, use a brown paper grocery bag with rectangular bottom. Cut a piece of cardboard the same size as the bottom. Cut an oval shape in the center of the cardboard. Using the cardboard as a pattern, cut a matching hole in the bottom of the bag. Punch a hole in each corner of the cardboard piece. Glue cardboard to bottom of bag, matching the oval openings. Take all free ends of the string and tie them together, so that all lengths are even. Tie them to the actual kite string, which is already wound around a piece of wood or other kite string holder. Decorate as desired. Have fun kite flying! Tear out a full page color picture from a magazine. Cut up the picture into puzzle pieces. Have at least one puzzle per scout. As each scout arrives, hand him one to put together. If time permits, let the scouts exchange puzzles. Find the following words in the word search. Words may be vertical, horizontal, or diagonal. Find your way through the maze on the last page and collect the glass containers. These items are all made from recycled glass. 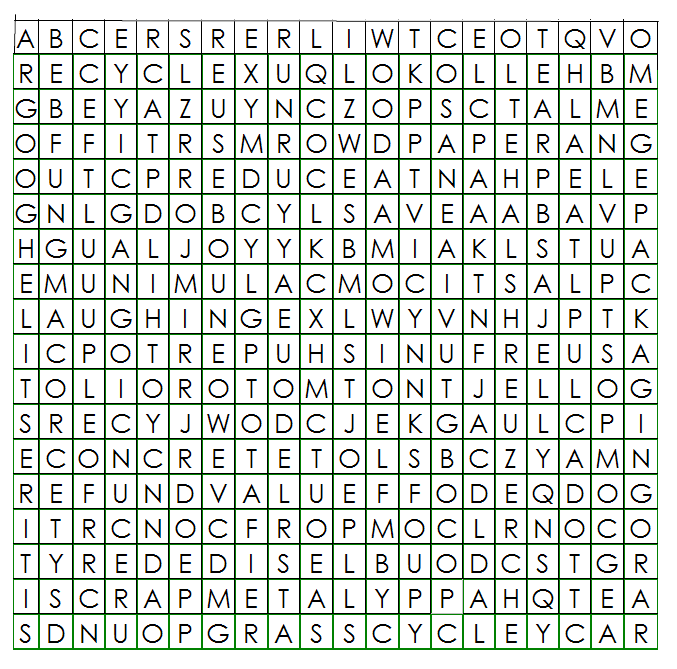 Which of these items can you take to the recycling center and redeem for money?? What other ways can you reuse your glass containers?? Recycling helps us preserve our environment and keeps garbage out of our landfills. There are also a lot of other reasons to recycle. 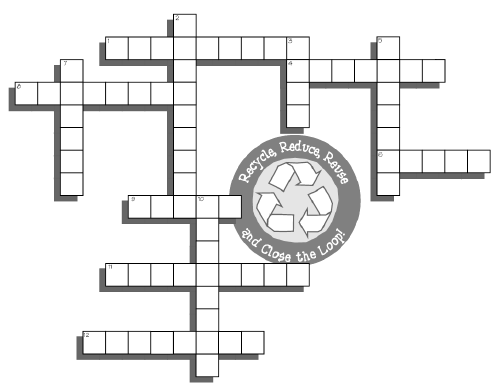 Complete the crossword to find out why we should recycle. 6. never wears out, it can be recycled forever. 8. Recycling helps keep fewer materials from going to the _______. Many are already full which means we need to find new places to put garbage. 9. You can earn ________by turning in your beverage containers at the recycling center. 11. Recycling lets us reuse ________ instead of having to get more from the Earth all over again. 12. It takes 20 times more energy to make an _________ can from new materials than from recycled materials. 5. Taking things that would be ________ and reusing them is a great way to help save the Earth. 7. It takes less ________ to make a new product from recycled materials than it does from raw materials. 10. ________ must recycle in order to make the world a better place.